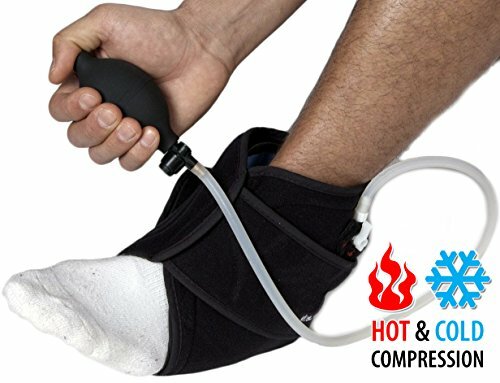 The Hot/Cold & Compression Ankle Support's simple on/off ergonomic design enables mobility during wear for a faster return to daily living and its built-in compression system and included gel pack provide targeted hot or cold treatment with quick, easy operation, ideal for treating the pain and swelling associated with arthritis, household accidents, sports injuries, or chronic pain conditions. NO PRESCRIPTION REQUIRED: Same ThermoActive technology of our medical line, but adapted for consumer use. HELPS ACCELERATE RECOVERY from injuries while delivering targeted relief from pain for the ankle. HOT OR COLD THERAPY: Either heat in microwave or chill in freezer or refrigerator, depending on the stage of your recovery. Includes one support, one compression air pump, one pair of extender straps, and one removable hot/cold gel pack. Washable and reusable. If you have any questions about this product by NatraCure, contact us by completing and submitting the form below. If you are looking for a specif part number, please include it with your message.